Gastric band surgery is targeted towards reduction in weight of an individual who is obese, and has lost the ability to complete his day to day life activities. Excessive weight is a major problem and it leads to extra pressure on your heart, kidneys and other vital body organs. It limits your work potential and leaves you dependent on others. Gastric Band surgery helps you in reducing your body weight with the help surgery that alters your digestive tract and manipulates the process of digestion. This procedure has shown great results with some minor complications in some individuals. It is very important for the body to prepare for the surgery. Your doctor will assess your body condition and upon the diagnosis will suggest you to follow a routine before the surgery. This might include change in eating habits, reaching a target weight, exercise, avoiding certain medications etc. This will facilitate the surgeon to carry out the procedure on you and you will get the maximum benefit from the surgery. 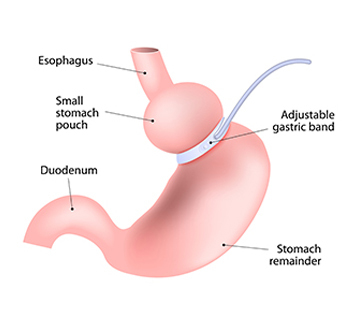 Gastric banding is a technique which is used by doctors to reduce the intake of food by the patient. The surgery is usually done through a laparoscope, this involves making of three to four incisions in the abdomen for gaining access to the patient’s stomach. The incisions will help in inserting the required surgical instruments, a camera and a band that needs to be tied around the stomach. Once your surgeon has gained access to the stomach, he can start the process of tying a band around the stomach, this band can be adjusted and thus allows the doctor to decide the portion of the stomach that needs to be kept free for taking in the food. This procedure helps in reducing the size of the stomach and consequently the eating capacity is also reduced, in this way your body starts consuming the stored fats and carbohydrates and the process of loss of weight becomes faster. The surgery is no miracle and takes time to show its results. The best results are shown in the patients who have a will to recover and lose weight. You should keep your monthly targets for losing weight and it is always good to follow a strict diet plan. The only problem that a person might face is with excessive skin; your doctor might advise you to undergo skin reduction surgery after you have successfully lost the target weight. That will also assist in shedding several pounds quickly. Gastric band surgery is a minimally invasive surgery and healing time is less. Some patients can go home within days after they have been evaluated for no signs of any problem. The major issue that doctors have in performing the surgery is the weight of patient. They have to set a target weight for the patient as it leads to reduce the risks during surgery. Some patients might suffer from irregular breathing or maybe small cardiac problems like Blood pressure etc. Death rate is generally very less.